Whether you’re visiting Seattle on business or out on the town, sometimes you might find yourself needing a ride. Fortunately, Seattle has plenty of options in terms of taxis as well as rideshare apps like Uber and Lyft, both of which have a solid presence in the city. Seattle’s taxis can be a great way to get around. Taxis are more flexible than buses and don’t require any sort of account like car sharing companies or rideshare apps do. 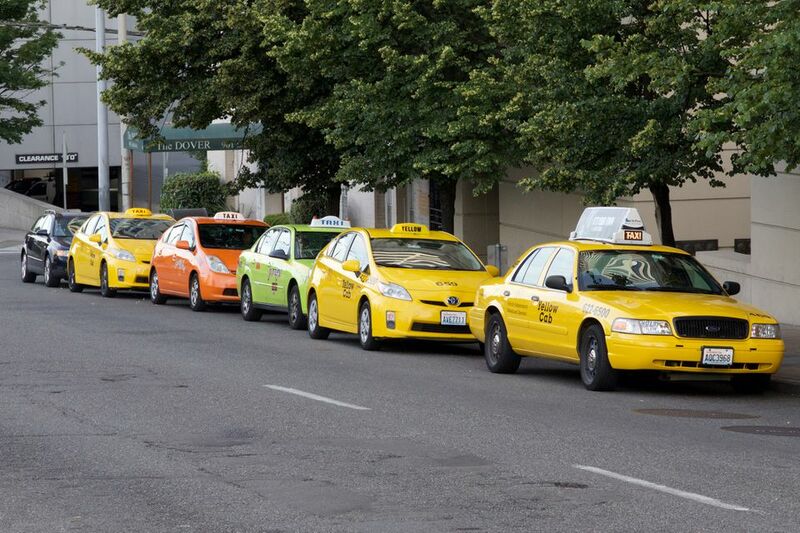 While Seattle isn’t quite as taxi-centric as larger cities, it has made some major strides. Finding a taxi is less stepping out onto the curb and whistling and more knowing where the taxis congregate. But if you're not in a part of town that has quick access to taxis, ride share apps are another way to go too. Uber serves the entire Seattle-Tacoma area and offers options where you share your Uber with other riders or have the car to yourself, which gives you flexibility on the cost. For instance, while taxis offer a flat rate of $40 from the airport to downtown Seattle, Uber's cost ranges from about $25 for a pool to $65 for an SUV. Lyft operates under the same principles as Uber with a variety of price points and the ability to have a driver pick you up wherever you are and drop you off where you need to go. Lyft also serves the entire Seattle-Tacoma area. If you need a ride from the airport, Uber and Lyft can pick you up, but there is no established stand for drivers like there is for taxis. You will have to clarify with your driver where to pick you up, which is usually on the arrivals level or in the parking garage, and it can depend on the type of vehicle you get. Check out Uber's airport info and Lyft's airport info. How do I get a taxi in Seattle? You might be able to hail a taxi from just anywhere on the sidewalk, but this isn’t the most common way to get a taxi in Seattle. For the most part, it’s best to call a taxi company directly and either set up an appointment or schedule a pick-up, or use the taxi company's app to book a pick-up. Alternately, you can ask most major hotels to call a taxi for you, and fortunately there are many hotels in downtown Seattle. Often, hotels will assist you with calling a cab even if you are not staying there. How do I schedule a taxi pick-up? More major taxi companies, like Orange Cab and Yellow Cab, have come into the future and let you book via app these days, making them just about the same as rideshare apps. You can also call or book online. Alternately, you can also book online with most companies. How do I get a taxi at Sea-Tac Airport? Seattle Yellow Cab taxis are located at the taxi stands on the third floor of the parking garage. They are available 24/7, 365 days a year, and there are large 8-10 passengers vans as well as regular taxis. Yellow Taxi has an app you can get from their website, which allows you to book in advance and even watch your taxi on a map, or you can call the company as well. If you take a trip between the airport and Seattle’s downtown hotel district, there is a flat fee of $40 (this does not count for the reverse trip for the trip from downtown to the airport). While the meter may run, you will pay the flat fee, but it never hurts to confirm this when you get in a cab either.